The Maeldune Heritage Centre houses the 42 foot Maldon embroidery which celebrates the 1000th anniversary of the Battle of Maldon. 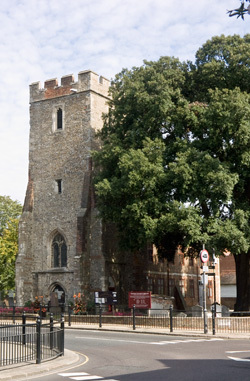 With its entrance located in the old tower of St Peter's church, the centre also houses art exhibitions, historical displays and a gift shop displaying local products and works of art. The Maeldune Heritage Centre is also home to the digital collection of nearly 3,000 photographs of the Maldon district which can be viewed and prints ordered if required. The Maldon Embriodery was designed by Humphrey Spender and depicts Maldon's history from the Battle of Maldon in 991 to its anniversary in 1991. It took over one hundred people more than three years to produce this work which is made up of seven panels each measuring 6 feet long by 26 inches deep. Open Tuesday, Wednesday, Thursday, Friday & Saturday 11am to 4pm (Closed Sunday & Monday). Admission is free.